Adaptive resource allocation has been shown to provide substantial performance gain in OFDMA-based wireless systems, such as WiMAX, when full channel state information (CSI) is available at the transmitter. However, in some fading environments (e.g., fast fading), there may not be a feedback link sufficiently fast to convey the CSI to the transmitter. In this paper, we consider resource allocation strategies for downlink multiuser mobile WiMAX systems, where the transmitter has only the channel distribution information (CDI), but no knowledge of the instantaneous channel realization. We address the problem of subchannel assignment and power allocation, to maximize the ergodic weighted-sum rate under long-term fairness, minimum data rate requirement and power budget constraints. This problem is formulated as a nonlinear stochastic constrained optimization problem. We provide an analytical solution based on the Lagrange dual decomposition framework. The proposed method has a complexity of (KM) for K users and M subchannels. Simulation results are provided to compare the performance of this method with other allocation schemes and to illustrate the tradeoff between maximized weighted-sum rate and the constraints. The mobile version of the Worldwide Interoperability for Microwave Access (mobile WiMAX) is one of the solutions in the competition for wireless broadband applications in challenging mobile environments [1, 2]. The mobile WiMAX air interface is based on orthogonal frequency division multiple access (OFDMA) for improved performances in multipath environments. One of the future aspects of OFDMA is the subchannelization which allows to group a total number of subcarriers into subsets of subcarriers called subchannels . The major advantage of subchannelization is the provision of frequency diversity. A byproduct of the subchannelization is that the need for knowledge of radio channel quality is reduced from per-subcarrier to per-subchannel resolution and resources are allocated on per-subchannel basis. There are three types of subchannelizations, namely, adaptive modulation and coding (AMC), partially used subchannelization (PUSC), and fully used subchannelization (FUSC). With AMC, the subchannels are composed of contiguous groups of subcarriers. With both PUSC and FUSC, the subchannels are composed of distributed subcarriers. For PUSC, the set of used subcarriers, that is, data and pilots, is first partitioned into subchannels, and then pilot subcarriers are allocated within each subchannel. For FUSC, the pilot tones are common for all subchannels and are allocated first and then the remaining subcarriers are divided into data subchannels. In general, AMC is well suited for stationary, portable, and low mobility applications, whereas PUSC and FUSC are the best alternatives for mobile applications. We employ FUSC in this work. This method uses all the subchannels and employs full-channel diversity by distributing the allocated subcarriers to subchannels using a permutation mechanism. Thanks to the frequency diversity provided by the FUSC, the performance degradation due to fast fading in mobile environments is minimized. Mobile WiMAX aimed at delivering broadband mobile services ranging from real-time interactive gaming, VoIP, and streaming media to nonreal-time web browsing and simple file transfers. Users have channels of different quality. With classical best effort transmission, unfair resource allocation can lead to starvation of some users in bad channel conditions. Therefore, the achievement of fairness among users while satisfying users' minimum rate requirements is an important issue. Most of the previous works on OFDMA resource allocation have considered only the case where instantaneous channel state (CSI) is available at the transmitter and various algorithms based on instantaneous CSI have been developed [4–14]. In , adaptive subcarriers assignment to minimize the total transmit power is investigated. The authors presented a heuristic algorithm, the so-called Hungarian algorithm, based on constructive assignment and iterative improvement. Following the Hungarian approach,  proposed an iterative algorithm for power minimization and bit loading. The algorithm is considered as suboptimal for adaptive modulation. To reduce the computational complexity,  proposed low complexity and computationally efficient bandwidth and power allocation algorithms to solve the problem of minimizing the total power consumption under bit error rate and transmission rate constraints. In , the performance of bandwidth-constrained power minimization and power minimization schemes in terms of outage probability and packet error rate under user data rate satisfaction are compared. It is shown that, in severe shadowing environment with both frequency selective and flat fading, the former scheme outperforms the later. Fairness issues in a wireline multiaccess channel have been taken into account in [8, 9]. The authors introduce the concept of balanced capacity to characterize the multiuser channel performance with total power constraints in  and they extend the concept to individual power constraints in . This concept of balanced capacity is closely related to the one presented in  where a low complexity suboptimal algorithm that maximizes the sum capacity while maintaining proportional fairness among the users data rate is developed. In , suboptimal resource grids and power allocation algorithms to maximize the total throughput under user's data rate requirement are presented. Rate-power allocation algorithms for expected mutual information maximization based on partial channel knowledge have been developed in . In , the authors investigated the impact of imperfect channel information on OFDMA-based systems under fairness and minimum rate constraints. Instantaneous resource allocation strategies are suitable for quasistatic or slow fading environments. However, when the channel variations are fast, the transmitter may not be able to adapt to the instantaneous channel realization. Hence, CSI-aware resource allocation is not suitable for environments with high mobility. When the channel state can be accurately tracked at the receiver, the statistical channel model at the transmitter can be based on channel distribution information feedback from the receiver. We refer to knowledge of the channel distribution at the transmitter as CDIT. Power allocation for ergodic capacity maximization in relay networks based on CDIT under high SNR regime has been studied in . This paper addresses CDIT-based resource allocation strategies for mobile WiMAX in all SNR regimes. The goal is to adaptively assign subchannels and distribute the total power to users with the objective to maximize the ergodic weighted-sum rate under tunable long-term fairness, minimum data rate requirements, and a total power constraint. This constrained optimization problem is formulated as an infinite dimensional stochastic problem. To efficiently solve the problem, we propose an analytical method based on the Lagrange dual decomposition framework. The remainder of this paper is organized as follows. In Section 2, the system model considered is described and the ergodic weighted-sum rate is derived. The problem of multiuser resource allocation based on CDIT is formulated in Section 3 and a solution guideline is given. In Section 4, some simulation results are presented. Finally, conclusions are drawn in Section 5.
where is the mean of the distribution. where is the rate allocated to user at time and is the parameter that controls the latency of the system. This way, we consider both current rate as well as rates given to the users in the past, what is suitable for long-term fairness evaluation. The first constraint in (5) is for the user's specific minimum data rate demand. We assume that appropriate admission control is performed such that the minimum data rates are feasible. The second constraint is system limitation on transmits powers. Note that the optimization problem (5) involves both continuous variables and boolean variable . Such an optimization problem is neither convex nor concave with respect to ( ). is the exponential integral function of . where . The expression (19) is in the form of multilevel water-filling power allocation with cut-off subchannel SNR below which we do not transmit any power, and above which we transmit more power when is higher. The important difference is that, in contrast to the CSIT-based allocation where the depends on the instantaneous channels realizations, the optimal allocation here is dependent on the mean of the channel distribution, and thus needs to be computed only when the statistics of the channel has changed. If some of the individual rate constraints are exceeded, the corresponding is equal to zero. We next consider the optimization of over . The function can be shown to be a convex function of , which can then be minimized via a one-dimensional search with geometric convergence. The optimal values correspond to the ones that satisfy the total power constraint (with equality). where and given in (5) and (24) are the optimal values of the primal and dual problems. The inequality follows from the positivity of and the weak duality theorem . Without the minimum rate constraints in (5), problem (5) becomes a standard convex optimization problem, and then the duality gap is zero. Due to the nonlinearity of the minimum rate constraints, the convexity of problem (5) does not hold. However, the nonconvex optimization problem (5) for the investigated OFDMA-based WIMAX system fulfills the time-sharing condition as defined in . Then when the power constraint is met tightly, that is, with equality, the duality gap is zero, and thus solving the dual problem (24) also solves the primal problem (5). In order to assert the relevance of our approach, it was decided to compare it to the instantaneous allocation based on partial CSIT and to the instantaneous allocation based on perfect CSIT. In expression (32), and are the shape parameter and the rate parameter of the Gamma pdf, respectively, where is the ratio of the subchannel estimation error variance to the background noise variance. is the Gamma function of . This is a multilevel water-filling power allocation with cut-off subchannel SNR . The difference between (40) and (19) is that the power allocation in (40) depends on the instantaneous subchannel SNR while the one in (19) depends on the mean of the SNR distribution . First, thanks to the subchannelization, the need for knowledge of radio channel quality in mobile WiMAX is reduced from per-subcarrier to per-subchannel resolution and resources are allocated on per-subchannel basis. 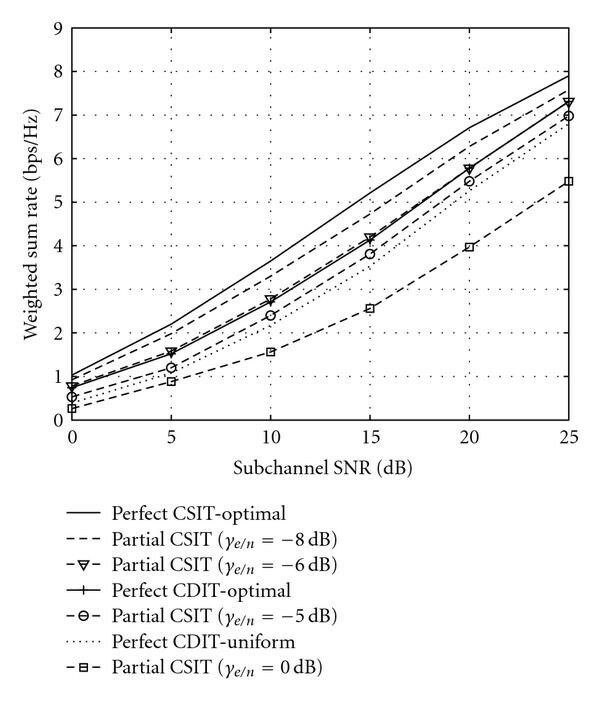 Second, under CDIT-based allocation, instead of feeding back the instantaneous channel coefficients to the transmitter, the users simply feed back the mean of the subchannel SNR distribution. Putting these two facts together, the amount of feedback required for the resource allocation reduces significantly. Using a dual decomposition framework, the optimization problem has been reduced to a per-subchannel optimization, and the computational complexity has been significantly decreased. 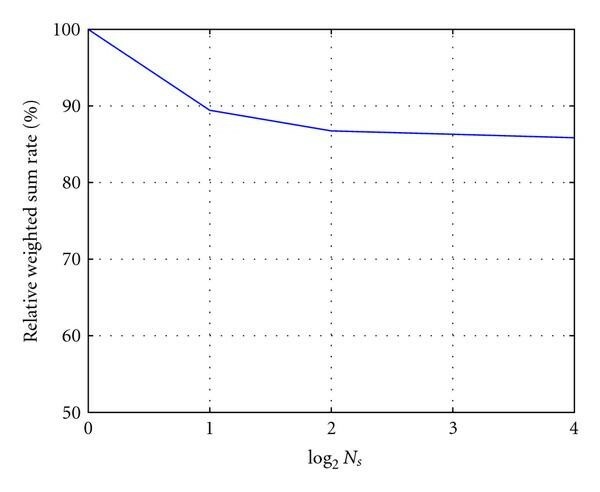 Since the optimal and depend on the mean of the subchannel SNR distribution and not on the instantaneous values, they need to be computed only when the statistic of the channel has changed. We need to run the line search to compute for . This is followed by the computation of values of multipliers (27) and power allocation values (30). We assume the line search to require iterations. The computation of and requires operations. The overall complexity order for the CDIT-based resource allocation is thus . Since is just constant independent of and , the complexity is . Once , , and have been determined, we do not need to update them as long as the statistics of the fading channel remains the same. Both expressions (19) and (40) are in the form of multilevel water-filling power allocation with cut-off subchannel SNR . Thus, the complexity in term of water filling is the same. The main difference between (19) and (40) is the amount of feedback required to perform resource allocation. Recall that, for the CSIT-based scheme, the allocation is performed after each OFDM symbol period. Let be the number of OFDM symbol periods after which the CDIT-based resource allocation is performed. Then a rough estimation tells us that the complexity of the CDIT-based allocation is reduced by compared to the perfect CSIT scheme. In the tradeoff analysis, we vary the constraints, and see the effect on the maximized weighted-sum rate. We define a relaxation coefficient for the minimum rate constraint and replace the minimum rate requirement by to form a perturbed problem. When , this reduces to the original problem (5). By increasing , the minimum rate constraints are relaxed. We can also vary the fairness parameter . Setting to results in the maximum throughput allocation. For , this results in the proportional fair allocation. The relaxation of the constraints leads in general to an improvement of the optimal objective. The tradeoff curves are found by solving the perturbed problem for many values of and . To illustrate the performance of the proposed resource allocation method, we perform simulations for a three-users mobile WiMAX system with bandwidth divided into subchannels. The subchannels are formed using the FUSC which is suitable for mobile applications. The FFT size of the OFDMA is 512 points. The performance is evaluated in multipath channel environments modeled as a tapped delay line with six taps as specified in the ITU M.1225 Vehicular A channel model . We consider a scenario where user 2 is every time closer to the base station than users 1 and 3 and the relative mean SNR difference between user 2 and users 1 and 3 is dB and dB, respectively, while the minimum data rate demand of user 3 is higher than the one of users 2 and 1 ( ). The target bit error rate is set to (without channel coding). The performances are evaluated using simulations over 10 000 instances of independent channel realizations. For all the simulations, the total power is set to . In Figure 1, the performance of the proposed adaptive resource allocation is compared to those of optimal resource allocation based on perfect CSIT, resource allocation based on partial CSIT and a uniform power allocation. The result shows that the proposed adaptive resource allocation brings significant gain over resource allocation based on partial CSIT with higher estimation error. We can observe that when is small, that means the effect of the estimation error is less dominant than the one of the background noise, the optimization under partial CSI is closed to the one under perfect CDIT. For very low estimation errors, the partial CSIT-based scheme outperforms the perfect CDIT scheme. The weighted-sum rate degrades quickly as the estimation error grows, especially for high SNRs. 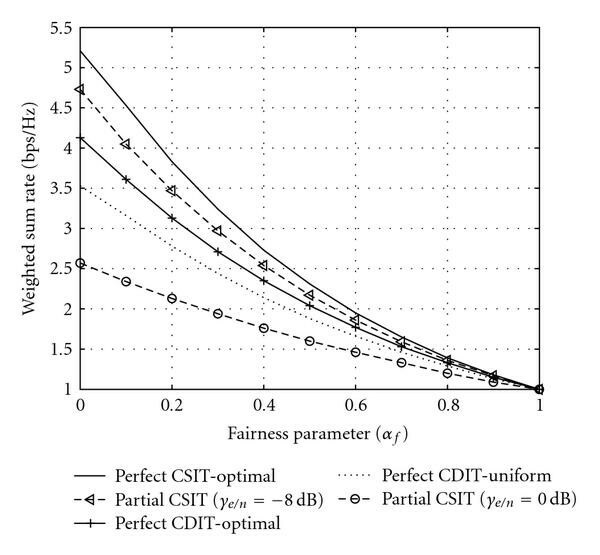 The highest weighted-sum rate is obtained with perfect CSIT but the difference in terms of performance is not so significant compared to the difference of complexity between CDIT-based and CSIT-based allocation schemes. The proposed method outperforms the uniform power allocation. Maximized weighted-sum rate versus mean SNR for different resource allocation schemes and fairness parameter . Figure 2 shows the user's rate for different allocation schemes when the users minimum data rate demands are constrained to and the fairness parameter is set to 0. We observe that under optimal allocation based on perfect CDIT, the need of all users in terms of data rate is satisfied. This is neither the case under allocation based on partial CSIT with high estimation error nor under uniform allocation where the high data rate demand of user 3 is not satisfied. Users rates for different resource allocation schemes, mean SNR of 15 dB and fairness parameter . Figure 3 illustrates the tradeoff between the maximized weighted-sum rate and the fairness constraint when the minimum rate demand is relaxed to with The average user rates are updated according to (4) with . The maximum weighted-sum rate is achieved when which is very unfair. We can see that, as the fairness constraint is enforced, the weighted-sum rate decreases. For , the allocation is strictly fair but inefficient in terms of sum rate. Looking at the solution obtained for different values of , the system designer may then make a choice about the configuration he considers to be the most appropriate. Tradeoff between maximized weighted-sum rate and fairness requirement for different resource allocation schemes and mean SNR of 15 dB. 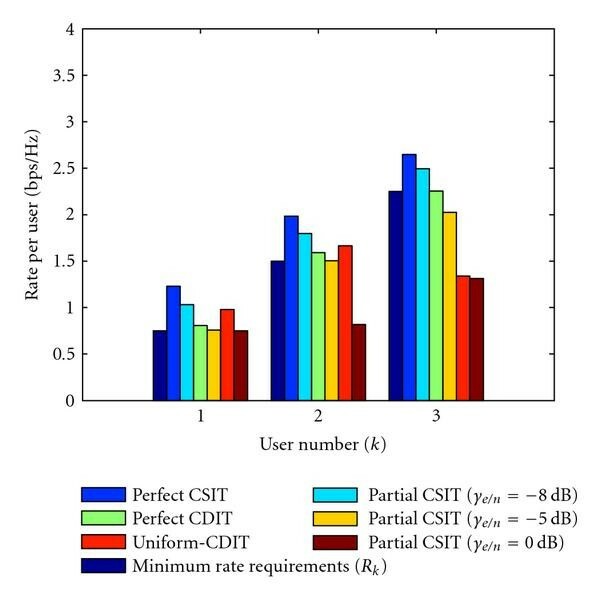 The tradeoff between reduced complexity and performance degradation of the proposed CDIT-based resource allocation in comparison with the perfect CSIT allocation is shown in Figure 4. Adapting the transmission strategy to the short-term channel statistics, that is, reducing increases the performance but also increases the complexity. However, if the transmission is adapted to the long-term channel statistics, that is, for larger , the complexity decreases significantly but with a penalty on the performance. For a CDIT-based allocation with a distribution taken over 16 OFDM symbol periods, the complexity is reduced by while the performance degradation in terms of weighted-sum rate is less than . Tradeoff between reduced complexity and performance degradation of the CDIT-based allocation compared with the perfect CSIT. In this paper, we have presented a resource allocation method that maximizes the ergodic weighted-sum rate of a multiuser mobile WiMAX while satisfying user's specific minimum rate demand and system fairness requirement for a given power budget. Though this is originally a nonlinear optimization problem, the problem can be reformulated as a Lagrangian dual problem. From this, a method has been proposed to efficiently solve the problem. The proposed method can find the optimal solution with significant lower computational complexity than the optimal CSIT-based allocation schemes. In fading environments, even with CDIT only, adaptive resource allocation strategies provide performance gain for OFDMA systems. Since user mobility is the principal driving force for mobile WiMAX, CDIT-based resource allocation strategies are of particular interest. These methods can be applied to other mobile OFDMA-based wireless systems such as Long Term Evolution (LTE) or High-Speed Downlink Packet Access (HSDPA). This work was supported in part by the European Commission in the framework of the FP7 Network of Excellence in Wireless COMmunications NEWCOM++ (Contract no. 216715).